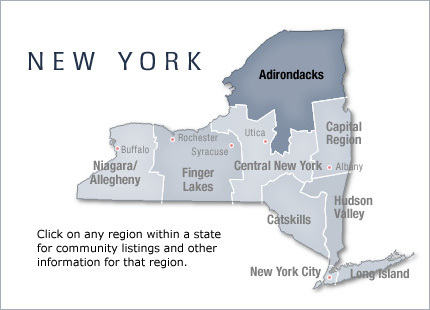 The Adirondack mountain range is located in the northeastern part of New York that runs through Clinton, Essex, Franklin, Fulton, Hamilton, Herkimer, Lewis, St. Lawrence, Saratoga, Warren, and Washington counties. The mountains are often included by geographers in the Appalachian Mountains, but they are geologically more similar to the Laurentian Mountains of Canada. They are bordered on the east by Lake Champlain and Lake George, which separate them from the Green Mountains in Vermont. They are bordered to the south by the Mohawk Valley and to the west by the Tug Hill Plateau, separated by the Black River. This region is south of the St. Lawrence River.